Enhancing their already impressive reputation for transparency, Heroic Games are highlighting the results of their latest network stress test. The highly significant video shows an early, large-scale raid test for their pre-Alpha game, Ship of Heroes. The intention was to create 80 clones and have them all onscreen walking around at once while maintaining a minimum 30 fps. They exceeded that by a huge margin. The proof is in the pudding, or in this case, in the video. One of the questions that comes up when talking to MMO veterans about Unreal Engine 4 is about its ability to handle large numbers of players in an MMO environment. MMO's, by their nature, have many players all in the same place at the same time, they're wearing different clothes/armour and have different expressions, faces and hair, they're engaged in different animations, facing different directions, etc. and the players expect to be able to see each other clearly. MMO players typically spend a lot of time creating a character and want others to be able to see the results. The Ship of Heroes character creator allows for an astonishing range of modifications right down to some great hair and totally amazing eyes - you really have to see what they're done with those! You can take a look at the progress on the eyes from a youtube video posted back in March 2017. The video ends with 100 clones onscreen spread out all simultaneously attacking an unfortunate NPC. Ship of Heroes is the first MMO to show the possibilities of such large numbers of players onscreen simultaneously with Unreal Engine 4. 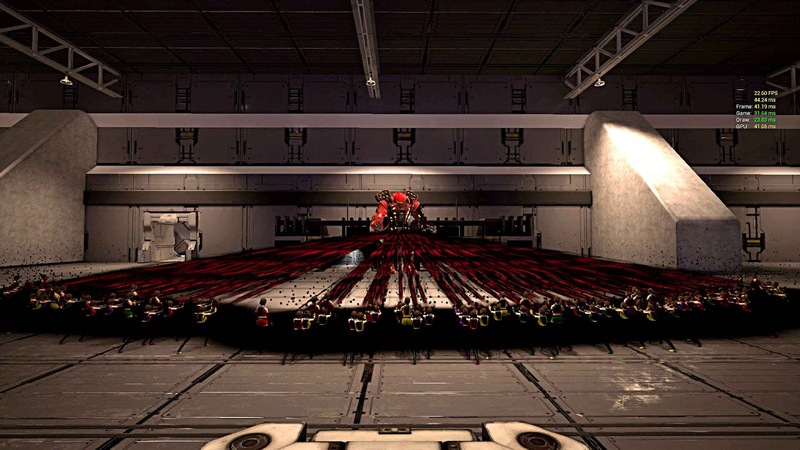 The engine allows for the usual customisations by the players to improve performance on their own machine - none of those customisations were used for this video. It doesn't take a huge leap of faith to realise the possibilities those sorts of numbers open up for the game. The intention is to have raids involving up to at least 50 players from level 1, this is in stark contrast to the majority of MMO's which feature raids as endgame content. And, of course, if the engine can handle that many players, then it can easily cope with many NPC's which typically require less bandwidth. Ship of Heroes is gearing up for some epic battles! Ship of Heroes conducted a successful Alpha test of their character creator in September, and plans to do their first combat Alpha test next month, with a Beta launch at the end of 2018. Chris from mmoreporternetwork interviewed Casey McGeever, the CEO of Heroic Games on 31st March 2017. It was a long video, over an hour, and packed full of really interesting information. I've created a basic index into that video. Please note that this video was pre-kickstarter and a lot of the information is liable to change. 08:50 20 levels on the ship, plus engineering at back and command & control at the front. Each level has above and below ground sections. Here's a shortened version to give you some idea of what's planned. I really recommend reading the full listing on the official newsletter though - it's well worth a read. Entries in dark green are not expected to be in the game at release, they will be added later. I've updated the gallery and the heroships pages with some new images including some exciting concept art kindly provided by Heroic Games. I also made the site more mobile friendly - apologies for that oversight. From a Youtube Video posted by 'Dirtylittlesecrets' on 10th March 2017 - bear in mind this was pre-kickstarter and a lot of information may have changed - I found it a really interesting video and, in fact, a lot of information not previously publicly shared was revealed in that video. 11:30 NPC's, numbers expected, etc. 57:50 Initial alpha/beta dates, etc. SoH Community Wiki Needs Your Help! The Ship of Heroes Community Wiki, set up by Broxen, needs more people willing to assist with creating/updating pages and uploading material of interest to the SoH community. If you can help, please head on over to the site, create an account if necessary, and join in. What on earth is Unobtanium? According to the backstory on the official website, it's the rarest material in the galaxy and infers all sorts of interesting benefits including being a power source for the ships we use to travel through deep space. It affects life forms in strange ways, sometimes accelerating their evolution. For humans, exposure to the material results in an increased birthrate of super powered children and such exposure is actually encouraged in order to advance the humans on board as much as possible. That's the explanation for the number of super heroes on board, anyway. Such a material also provides handy hooks for fans to fit their own characters evolution into the backstory. Unobtanium is a hugely valuable material to all species. The dust produced as a by-product from running the engines can be converted back into whatever form of Unobtanium any particular species needs and the amount carried in the heroships makes them a target for marauding pirates and aliens. The super heroes help to protect the ships and ensure the safety of the citizens living in them. It's not only external forces that we have to guard against. On board the ships are bands of mercenaries and villains who frequently carry out raids on the major cities in the quest for Unobtanium dust so a super heroes work is never done. There have been little snippets of information revealed about robots being affected by Unobtanium too and turning against their human masters. That opens up the possibility of them modifying other unaffected robots, turning them to the anti-human cause. The possibilities seem to be endless and I'll be looking forward to seeing the story develop through the life of the game. To be honest, I'm not a big fan of the name of this material but it was chosen by the community early on by a hefty margin when the developers of Ship of Heroes carried out a poll. There was a brief discussion on the forum about it and it's been a source of contention ever since. The question seems settled though so we have to accept the name and move on to the next exciting thing in the game. It is, actually, quite refreshing to see a team of developers taking the views of their fans into account at every stage. Of course, Heroic Games are ultimately responsible for putting it all together so not all ideas can be implemented but it's nice to be asked for input and actually have it considered. There are exciting times ahead for fans of science fiction and super hero games. Old posts wrt Ship of Heroes are over on my 'general' blog. I'll be starting afresh with this new fansite/blog but any important information will, of course, be copied across. Admittedly, it's a bit sparse at the moment but it won't stay that way for long. Please feel free to send any comments about the theme, etc. via the form on the contact page.